Citrus & Salt, Chef Jason Santos’ newest culinary expedition, opened in Boston’s Back Bay Monday night. Inside, the white-washed brick walls, strings of patio lights, and rows of desert plants in ceramic pots relocate guests right into the sights, sounds and smells of the Baja Coast. “It’s Mexican, but it’s not predictable Mexican,” Santos said in an interview. Citrus & Salt’s menu is an experiment in “playful, reimagined coastal cuisine,” according to the restaurant’s press release. With a raw bar and a variety of small plates, diners can try anything from pan-fried blowfish tails with almond jam and gooseberry salsa to crab and cactus chowder to warm agave-glazed biscuits with cinnamon butter and spicy poblano and pepperjack spread. Santos’ grilled corn is a messy, addictive take on a classic Mexican street food. It’s covered in crushed hot Cheetos, slathered in mayonnaise and sprinkled with shredded cotija cheese. After the wild success of his restaurant Buttermilk & Bourbon last year, Santos decided to open Citrus & Salt as a “sister” restaurant. He described the fundamentals of the two restaurants as similar — both utilizing small plate menus and similar branding techniques. Yet, though the restaurants share the same vibe, they have “completely different concepts” when it comes to cuisine, Santos said. With Buttermilk & Bourbon, Santos celebrated his love of New Orleans comfort food. Citrus & Salt’s Mexican cuisine, on the other hand, is an endeavor in authenticity, with Santos’ own creative spin on the textures and techniques incorporated into the dishes. Santos cultivated his culinary background in the discipline of fine dining. His first Boston restaurant, Abby Lane, serves what he calls “straightforward American.” But Santos believes the days of going to a restaurant simply to eat a good meal are over. Buttermilk & Bourbon was Santos’ first undertaking in the realm of trendy small-plate style dining. The popularity of the menu format, the elimination of potential kitchen mistakes and the freshness and quality of the dishes made sticking with the small plates an easy decision for Santos and his team. Longtime Santos fan Dawn Silvia Oates, 45, of Chestnut Hill, visited Buttermilk & Bourbon when it first opened last year and was blown away by the experience. Santos, a celebrity chef on Food Network’s “Hell’s Kitchen,” said that his goal with the sister restaurants was not fame or recognition. But why a West Coast cuisine for an East Coast native? While on vacation in Cancun and Cozumel in his early twenties, Santos instantly fell in love with Mexican food. As he gained culinary experience, he traveled to Mexico City and Oaxaca to dive deeper into his mastery of the cuisine. As a result of his passion for the true flavors of the country, Santos’ goal is to, “stay true to Mexico” with Citrus & Salt. From the cocktail menu, guests can find drinks with names like “#Unfollow” and “I Didn’t Text You, Tequila Did,” along with an extensive repertoire of tequilas, in true Mexican fashion. Citrus & Salt’s margaritas, made fresh at the bar, are less sugary than what one typically expects from the popular tourist drink. Behind the bar, a large mural of a Dia de los Muertos skeleton looms in stark black paint against the white-washed brick, a striking contrast to the overall “beachy, feminine” aesthetic of the main dining area, as described by the restaurant’s front-of-the-house partner Colleen Hagerty. 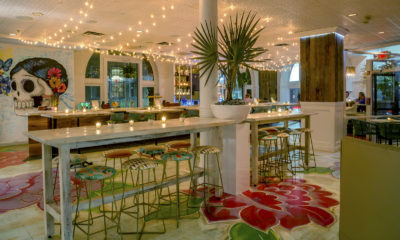 Nearby, a coiled octopus, painted with lurid black lines and funky pops of color, ushers guests down a dark hallway to the dimly lit “Garden of Santeria” lounge at the back of the restaurant. “Jason named her Cheryl,” Hagerty said, pointing the creature out with amusement.